Saturday night at Prospera Place in Kelowna, B.C. 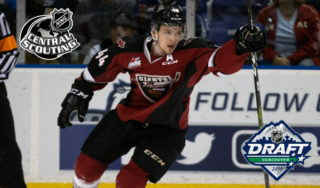 the Vancouver Giants wrapped up their 2017-18 regular season schedule with an 8-1 loss to the Kelowna Rockets. 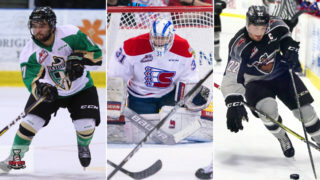 Dillon Dube and Leif Mattson each had two goals and two assists for the Rockets while goaltender James Porter stopped 21 of the 22 shots fired his way by a shorthanded Giants club. Milos Roman scored Vancouver’s lone goal while rookie goaltender Trent Miner turned aside 36 of the 44 shots fired his way by the Rockets. The first 10 minutes featured some great saves and good chances at both ends of the ice. From the initial drop of the puck until the media timeout there were a total of two whistles. Kelowna got the offense started at 14:43 of the first when defenceman Libor Zabransky raced down the right-wing on a three-on-one and wired a shot past Miner’s blocker and home for his second of the season. Shots through one period were 18-6 for the Rockets who held a 1-0 lead. Leif Mattson made it 2-0 Rockets at 6:16 of the second when his centering pass from the right-wing deflected off a Giants stick and in. Then at 10:50 off the rush, Dillon Dube scored his first of two on the night to increase the Rockets lead to 3-0. Milos Roman responded with the Giants lone goal of the game at the 16:03 mark of the middle frame when he snuck into the slot, took a James Malm feed from behind the net and snapped it past Porter for his 10th of the season. Just over two minutes later Kelowna responded with two strikes in a span of 22 seconds. First Gordie Ballhorn buried his seventh of the season off a shot from the right point. Then Kyle Topping parked himself in front of Miner and tipped home a Kole Lind pass home for his 22nd to make the score 5-1. Dillon Dube (6:04), Leif Mattson (13:05) and Kole Lind (17:10) added third period markers for the Rockets who outshot the Giants 44-22. Kelowna went one-for-one on their lone power play chance while the Giants finished zero-for-two. 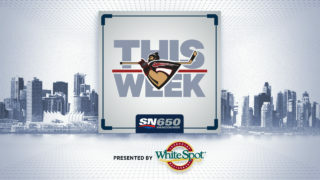 With the loss the Giants finished their season series with Kelowna at 3-4-1-0 and were 1-2-1-0 against them on the road. Overall the Giants finished the 2017-18 campaign with a record of 36-27-6-3 and their road record was 16-14-4-2. 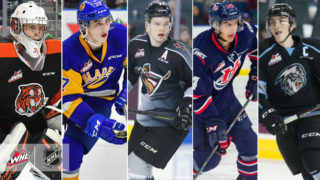 Up next for the Giants: Game 1 of Round 1 of the 2018 WHL Playoffs against the Victoria Royals. 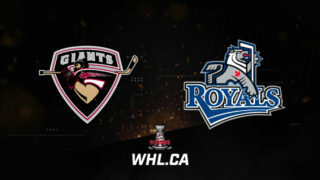 Game 1 goes next Friday, March 23rd in Victoria and Game 2 takes place a night later. Games 3 and 4 will shift back to the Langley Events Centre starting on Tuesday, March 27th and then again on Wednesday, March 28th. 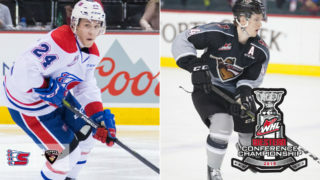 – Ty Ronning, Tyler Benson, Brayden Watts, Bowen Byram, Alex Kannok Leipert, Aidan Barfoot and Davis Tendeck were all scratched from the Giants lineup on Saturday in Kelowna. – Vancouver’s 36 victories in 2017-18 were their most since the 2011-12 season when they won 40 games. Their 27 regulation losses were also the lowest total since 2011-12 where they lost 26. – Only three points separated the Victoria Royals 39-27-4-2) from the Vancouver Giants (36-27-6-3). That three-point gap is the closest of any of the eight confirmed or potential first-round playoff matchups.